The two-term Congressman said his vote was deemed to have an invalid signature and he couldn't remedy it in time. Bill Nelson is suing to get his vote and others restored. CHARLIE KAIJO | Times US Rep. Patrick Murphy speaks to supporters at the Arco Iris restaurant on September 18, 2016. 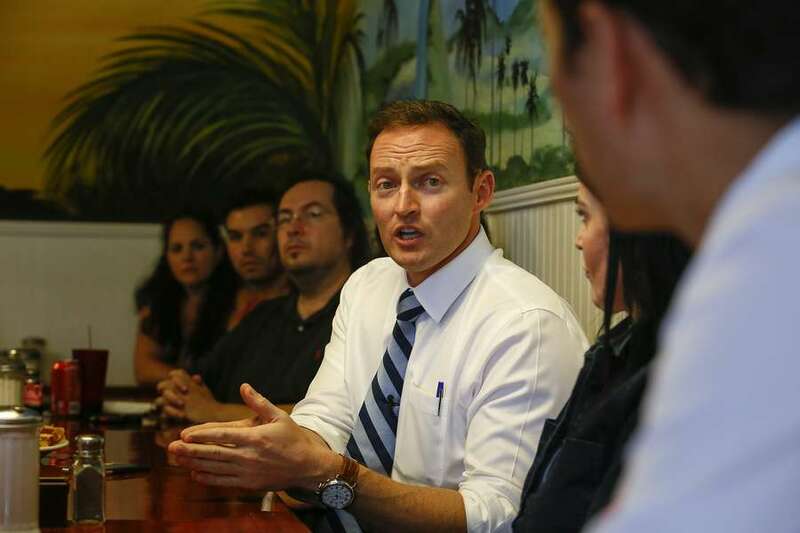 Rep. Janet Cruz and an intimate crowd of supporters joined Patrick Murphy to discuss his platform. As Florida's too-close-to-call election turned into a national story, former U.S. Rep. Patrick Murphy, in a moment of dread, checked to make sure his ballot was counted. "Invalid signature" the Palm Beach County elections website said. Murphy's ballot — and his votes for Democrats Bill Nelson, Andrew Gillum and Nikki Fried, all facing recounts — wouldn't count. "It's sickening, right?" Murphy told the Tampa Bay Times on Thursday. Murphy, the Democratic nominee for U.S. Senate in 2016, voted by mail. It's not clear why his signature was deemed invalid — he said he's had the same John Hancock for 15 years — and the Palm Beach County supervisor of elections did not immediately respond to a request for comment. If an election worker deems the signature on the ballot doesn't match the one on file with the state, then the ballot can be disqualified. Voters can review a ballot's status on the county website and cure any problems, but they must do so by 5 p.m. the day before the election. By the time Murphy checked it was too late. Nelson's campaign is suing the Florida Secretary of State and demanding that the state count all vote-by-mail and provisional ballots disqualified due to Florida's signature law. The lawsuit claims the state's signature matching law puts untrained, unqualified people in charge of verifying signatures and legitimate ballots are thrown out. It also says that minority voters are disproportionately disenfranchised by these laws. If successful — though a longshot — it would restore thousands of mail-in and provisional ballots disqualified because the signatures didn't match. "We got to make serious changes," Murphy said. "Not only for this specific example. Countless people's votes didn't count. Longer term, we need to make it more accessible for people to vote. It's borderline outrageous."